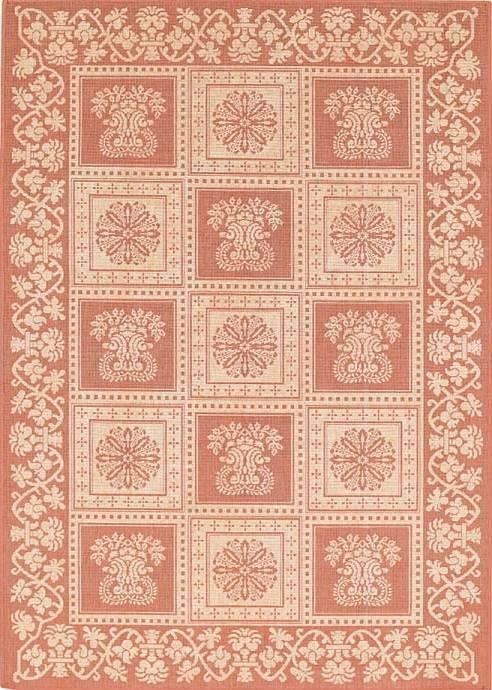 One way to change the look of your outdoor deck or patio area is to add a Finesse Williamsburg Terra Cotta Outdoor Rug machine woven that comes from France. Sunlight resistant; fade resistant and non-allergenic, each 3ft 11in by 5ft 6in rug is an excellent choice for any high traffic areas. Made with quality 100% Olefin accompanied by a Sunbrella fabric border and no fringe, these rugs are produced in France. Perfect for porches, verandas or busy areas of the house. They are easy to clean as spills wipe away with a damp cloth and warm water, or you can wash them with a water hose for heavy soiling, making sure you allow them to dry on both sides.